When I was seven years old, my mother brought home my baby sister from the hospital. I already had a younger brother and had been itching to have a little sister that I could play with and grow up with. While I championed for a girl, my brother wanted her to have a little boy. Unfortunately for him, I won (as much as any child can really “win” something they had no control over in the first place) and he’s been bummed about not having a little brother pretty much ever since. I’ll never relate, of course. I’ll never understand what it means to have a brother, either literally or a figurative “bro.” Being a big sister and having my relationship with my now 20-year old “baby” sister has been great. It’s been amazing. But the bond between sisters is one that is differently forged than the one between brothers. John Diggle knows this to be true. And he knows this to be true for three very distinct reasons. First, he’s an actual brother. Andy Diggle is a man that Dig saw in an idealistic light. We all want to believe the very best in the people we love, after all. But we’ve all been hurt when our trust has been broken by those same people. The thing is, it hurts so much more when that person is our own flesh and blood. Secondly, Diggle knows that the bond forged between brothers is different and special because he is a soldier. I’ve never been in the military, but I know from those who have that your unit and your fellow soldiers become your family. John Diggle’s meaning of “brotherhood” is layered with those experiences. And thirdly –– and more presently –– Diggle knows that the bond of brotherhood is something different, something to be treasured because of his relationship with Oliver Queen. I could wax poetic about the two, but I’ll save that for a bit later. 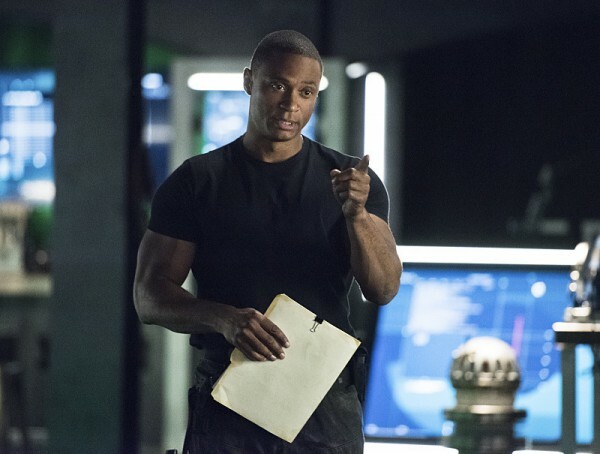 Suffice it to say, though, that Diggle’s definition of the term has expanded because of the things he has experienced and the people who have changed his life. But that’s not all that happens in “Brotherhood”: Oliver Queen and Damien Darhk come face-to-face and it’s about as ominous as you expect it to be. Additionally, Thea goes off the deep end a teeeeensy bit while on a date. Whoops. First of all, let me just talk about Oliver Queen for a moment because we are going to spend most of the time discussing the Diggles. How refreshing is it to see Oliver Queen give John Diggle rational advice? All of this Felicity Smoakin’ love must have cleared Oliver’s head of (most of) his absurdities. Because when Diggle presents Oliver with the file on Andy, the man’s first response is confusion and compassion for his friend. But then Oliver –– yes, OLIVER –– tells Diggle that he should give his brother the benefit of the doubt before giving up on him entirely. Even if Andy Diggle turned out to be a criminal mastermind, Diggle can’t just ignore the fact that this is his brother. “Things aren’t always what they seem,” Oliver warns, surely not (see: definitely) foreshadowing anything. One of the most poignant things to me in this episode though is the fact that Diggle doesn’t forgive his brother or want to believe in his brother’s innocence… even when it turns out that Andy Diggle is alive and a Ghost. While Felicity, Thea, Oliver, and Laurel are encouraging Diggle to try and find the good in Andy and believe in the man he once was until it is proven otherwise, Diggle shuts them all out and down. I honestly can’t help but draw comparisons to this past week on The Blacklist, where a character named Samar –– who believed her brother to have died years ago –– discovers that he is alive. She celebrates and then, unfortunately, discovers that her brother is a terrorist. In an extremely emotional moment, Samar has the chance to offer her brother to a criminal mastermind (played by James Spader), and she does. When her brother reminds Samar that she promised to always protect him, she tells him through her tears that her brother died years ago. This is nearly exactly what John Diggle says, too, when confronted with the fact that his brother could possibly be alive. It doesn’t matter if the body that Andy Diggle inhabited –– the one that looks like him and sounds like him –– is living and breathing. No, for Diggle, his brother died a long time ago. Gone now is the lens through which he saw him, gone is the trust he had in him, gone is the love that he had for him. There is a really great scene between Diggle and Laurel in this episode. And though these two don’t get to have many scenes together, the ones that they do always feel (to me, at least) like they have purpose. Because truly, Laurel knows what it feels like to gain a sibling back, but not really gain back the person you thought you once knew and loved. She knows exactly how it feels to stare into the eyes of your sibling –– the baby sibling you always swore to protect and the one you laughed and cried and fought with –– and not even remotely recognize them anymore. And though, as Dig reminds her, their situations are not identical, they’re similar. Laurel knows that if she didn’t believe in Sara, in spite of all the bad things she did, then Sara would not be the hero that she is today. If Diggle gives up on his family now –– in spite of all of the bad that Andy has done –– then he is giving up a piece of his soul in the process. See, Oliver needs Diggle to fight for Andy because he needs to believe in hope. Oliver needs to know that the city and the people within it can still be saved. Because if they cannot, what is there really left? The theme this season of Arrow is family, and we’ve seen that in just about every character (Felicity with her mom; Laurel with her father and sister; Oliver and Thea’s relationship), including Diggle. What’s really striking to me is that for an episode where Diggle spends 99% of it staunch and defiant and determined to not even give his brother a second thought, let alone trust him or confront him, he manages to drop quite a huge bit of truth tea onto Oliver in the process. Because of Oliver’s conversation, Diggle makes the decision to finally confront his really-alive-mind-controlled-by-Damien-Darhk brother. I understand why Diggle’s default setting is anger, though. While Laurel and Oliver were reckless in the way that they relentlessly pursued saving their siblings, Diggle was watching from the sidelines. And he believes that this intensely blinded them to truths that they would have otherwise seen. Diggle says as much in his conversation with Oliver –– Thea is a blind spot for Oliver. And Diggle won’t let Andy become that for him. Not after he has seen what it cost Oliver and Laurel when they saved their siblings. No, Diggle pushes the idea of reconciliation away because it doesn’t make any sort of sense to him. How can he ever look at his brother –– the man who died, leaving behind a wife and a child –– the same way again, knowing what he does now? How can he trust him again? How can he think of their memories as siblings and not have those be tainted? The problem is that he can’t do that. But what was always at the heart of Diggle’s quest to find out who murdered Andy? If you answered “answers,” you would be correct. And I think that answers and closure are the two major reasons that Diggle finally does decide to see Andy at the end of the episode. And Diggle gets the answers. They aren’t the ones that he wanted, but that’s what happens sometime in life. We can’t always get what we want, but the only way we will ever become better people –– the only way we can truly move forward with our lives and our relationships in healthy ways –– is if we try to mend the fences that we can, and walk away from the ones that we cannot. I’ve decided that Damien Darhk is my favorite television villain, perhaps ever. He’s right on par with Raymond Reddington at the moment, thus solidifying my theory that they’re secretly best friends and this is all just a set-up to a crossover with The Blacklist in the end. Shifting our focus away from Darhk for a moment, I want to talk about what I noted above –– the conversation between Oliver and Diggle. In the Lair 3.0, Diggle dumps a lot of truth tea on Oliver. We’re talking, like, rivaling the Boston Tea Party. Because Diggle notes that what Oliver is contemplating doing is setting him on the exact same trajectory that he was on before he made the horrible, unwise, relationship-ruining decision to join the League last year. Here’s what I love so much about Oliver and Diggle’s relationship: they are not afraid to yell at each other and hurt one another’s feelings. Diggle doesn’t care if Oliver begins to cry (which he does) and Oliver doesn’t care if Diggle yells (which he does). The two men love each other so much that they would rather be completely honest and have a blow-up than see the other one on a self-destructive path. Let’s face it: last year, Oliver was dumb. He was dumb and reckless and hurt people in the process. Sure, at the end of the season he had the chance to ride off into the sunset, but the path toward that Porsche was anything but rosy. He ruined his friendship –– his trust –– with Diggle because he wanted to believe that he could do it all himself. He wanted to believe that what he was doing was protecting those he loved. Instead, Oliver was really asserting his dominance in his decision to join the League and make plans with Malcolm Merlyn. This year, Oliver has shown immense character growth. It’s kind of mind-blowing, actually. But don’t be deceived –– the temptation to slip into his old habits is still there. The problem with Oliver is that he can justify anything. He can tell himself that he will be fine, that he won’t be affected by darkness, and that he is doing it all for the greater good. But rationalization is the first step toward a path of destruction and poor decision-making. Look at what happened to him before. Oliver’s small desires snowballed into large ones, until he was swept up in them and hurt the very people he wanted to protect. And this brings us back to the Lair, where Oliver essentially tells Diggle that he can handle himself against Damien Darhk. He can dismantle H.I.V.E. from the inside. As Felicity and Diggle point out though, that is precisely what Oliver said he could do the year prior and though he did –– though he beat Ra’s –– that came at a severe price. Diggle knows that Oliver is comfortable in the shadows and that even though he is a hero, there is still a part of him that feels content and powerful there. And Diggle knows, firsthand, that the darkness isn’t something that instantly clutches you and drowns you. It’s a slow process, one that happens gradually –– bit by bit –– until you’re caught up in it with no way to escape. He’s seen it happen to Oliver before. He’s seen it happen to so many people before. And he would be a fool and a terrible friend and brother if he let Oliver take one step onto that pathway. Because, as both Felicity and Dig also note (because they’re of one mind, obviously. #OG3TeamArrow), Oliver wanted to do things differently this year. How is slipping back into old habits by trying to infiltrate H.I.V.E. at Daminen Darhk’s side really exemplifying how much he has changed? How different he is? It isn’t. And though Oliver doesn’t initially want to hear this… Diggle is right. He can’t fight and win against Darhk the same way he did with Ra’s. No, this time, Oliver is going to harness all of the light (including, it seems, real and actual light) and fight to save the city through daylight. No more hiding in the shadows. No more being afraid of the dar(h)k. This is the year of the Green Arrow. And the Green Arrow is on a new path. MVP for this episode is unquestionably David Ramsey as John Diggle. I absolutely loved the scene where he and Laurel talked because of the way that Ramsey manages to make everything that Diggle says in the quiet moments so poignant and so emotionally intense. The subdued conversations are what really strike me about Ramsey as an actor. He is a big guy, but these moments are the ones where I find myself exceptionally captivated because they’re so gentle and yet so natural. I also think that the scene between Stephen Amell and Ramsey in the Lair 3.0 was one of their best interactions in the series to date. Both men were intense and emotional with one another in the way that only brothers can be. And the scene between Lyla and Diggle in their home was really understated but also so well-acted. Ramsey knows exactly when Diggle needs to be scary and intense, and when he needs to be gentle and a vulnerable. Bravo, David Ramsey, for an excellent performance. Seeing him with the rest of the cast made me realize that Brandon Routh is TALL. Both of the Queens are exceptionally bad at cover stories. In flashback-land this week: The Bland Inevitable Love Interest finds out that Oliver killed her brother in the last episode; Oliver is tasked with whipping Sketchy Army Dude Who Is Terrible with a cat of nine tails because apparently we have entered the Bible. There’s a minor story this episode involving Thea not being able to control her blood lust while on a date with Alex. That’s not extremely interesting. But what IS interesting is that apparently Damien Darhk’s powers don’t work on Thea. In fact, she seems to have weakened him/affected him somehow, and it takes him aback too. I assume that this is because of her little dip in the Lazarus Pit, but she basically tells Malcolm to be her lackey and figure out how to make whatever Damien did (which, by touching her, Damien alleviated some of her blood lust? Because magic?) permanent. Malcolm looks pleased that he has a purpose in this show again. “Even death’s not permanent anymore.” This is basically the official tagline for Arrow and Doctor Who. “Trust is an orchid –– beautiful, but delicate.” Damien Darhk is so poetic you guys, and have I mentioned that he’s my absolute favorite? Yeah, and Lance got found out by Darhk’s security team. The chances of him being the one in the grave just increase by the episode. “Oh, I’m just listing all the terrible ideas you’ve had in the last three years.” Felicity, let me get you a pen and some paper because that would fill a book. “And that’s just SWELL.” Guys. I’m not even kidding about Damien Darhk being my favorite character because WHO SAYS “SWELL”? DARHK DOES. AND IT IS DELIGHTFUL. “It’s Merida! Aren’t you out a little past your bedtime?” SERIOUSLY. BEST. VILLAIN. EVER. “My brother needed me. … The green one.” I literally cooed when that happened, and I’m not even remotely ashamed. “I’ve gotta do something different!” Ray says, as he prepares to put on the exact same suit and do the exact same thing, but in a different city in Legends of Tomorrow. The most shocking thing about this episode was that some of it took place during the day. I’d just assumed we were in a perpetual night, like Alaska in the winter, at this point. I found it fascinating that Thea affected Darhk's magic in that way. And it feels like it totally fits. I like that we've seen a little mysterious chink in Darhk's armor. I like that he recognized her fighting style and brought up Malcolm. I think it is entirely appropriate that the solution to Thea's problem could come from facing up to the Big Bad. I think it makes sense that her experience in the Pit would affect him because he was part of the League once upon a time and probably got his start down his magic path from the League's dealings with magic. It seems a natural connection and it was introduced beautifully. Plus, I like the idea of Thea's sarcasm coming up against Damian's similar sarcasm. Now that she doesn't have to be mortally afraid of him there could be some verbal sparring! Ray's period of self-reflection makes sense to me. He's been in captivity for months. The things he tried to do for the city with his company didn't stick. He's feeling a bit lost. He became a superhero but that hasn't solved his problems or filled the void left by the loss of his fiancee. I think a lot of driven people would feel lost after that. His interaction with Felicity was nice and that friendship works for me much better than the romantic relationship. She might enjoy being CEO but she knows that the company is Ray's creation and she not someone to hold onto the company at the expense of a friend. And I get that Ray might be feeling restless because no matter how much he understand Felicity's choice of being with Oliver it can't be pleasant to be around them all the time. There are probably multiple things behind his unease. I once felt like that and emigrated to another country even though my life was going really well. I loved the focus on Diggle and his relationship with the other characters. The scenes between him and Oliver lately have been amazing! When Oliver got choked up during their argument everyone felt he was reacting emotionally to the conversation whereas I just thought that as he raised his voice it really hurt his injured side and the pain took his breath for a moment. I like that Felicity and Diggle discussed Oliver's plan for infiltrating HIVE and they separately dissuaded him. They pointed out how awful an idea it was and how it would be more of the same when he is trying to move past the darkness. Part of me would have loved to hear their conversation. I know the scenes had to concentrate on other things but I always want to see a good Felicity/Diggle scene. The direction and fight scene choreo was brilliant and congrats to Bamford on that episode. The visuals were great but he also gave us some really amazing emotional moments with Diggle.